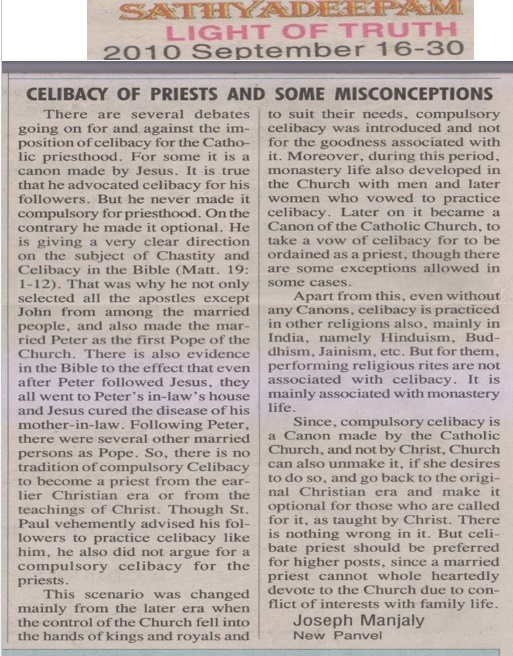 The following paragraphs are my opinion on the latest Supreme Court of India decision on the divorce law relating to the Catholic Christians in India as published in the LIGHT OF TRUTH in its 16-31 March 2017 issue. In fact there is no provision for Catholics for a divorce in the Canon Law. This is the basic reason for the start of the Protestant ‘Church of England’ (its Indian version - CNI and CSI) who protested against this and introduced divorce. This is in response to the article ‘CIVIL LAW AND CANON LAW’ in this publication dated 16-022017. 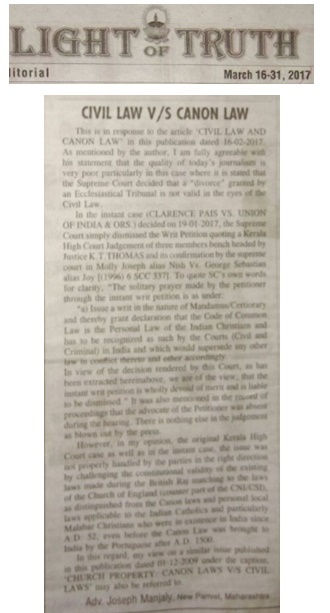 As mentioned by the author, I am fully agreeable with his statement that the quality of today’s journalism is very poor particularly in this case where it is stated that the Supreme Court decided that a “divorce” granted by an Ecclesiastical Tribunal is not valid in the eyes of the Civil Law. “a) Issue a writ in the nature of Mandamus/Certiorary and thereby grant declaration that the Code of Common Law is the Personal Law of the Indian Christians and has to be recognized as such by the Courts (Civil and Criminal) in India and which would supersede any other law in conflict thereto and other accordingly. ………….. In view of the decision rendered by this Court, as has been extracted hereinabove, we are of the view, that the instant writ petition is wholly devoid of merit and is liable to be dismissed.” It was also mentioned in the record of proceedings that the advocate of the Petitioner was absent during the hearing. There is nothing else in the judgement as blown out by the press. 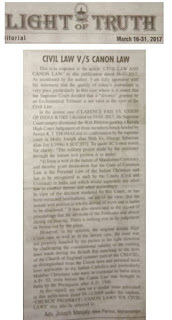 However, in my opinion, the original Kerala High Court case as well as in the instant case, the issue was not properly handled by the parties in the right direction by challenging the constitutional validity of the existing laws made during the British Raj matching to the laws of the Church of England (counter part of the CNI/CSI), as distinguished from the Canon laws and personal local laws applicable to the Indian Catholics and particularly Malabar Christians who were in existence in India since A.D.52, even before the Canon Law was brought to India by the Portuguese after A.D. 1500. In this regard, my view on a similar issue published in this publication dated 01-12-2009 under the caption, ‘CHURCH PROPERTY: CANON LAWS V/S CIVIL LAWS’ may also be referred to. 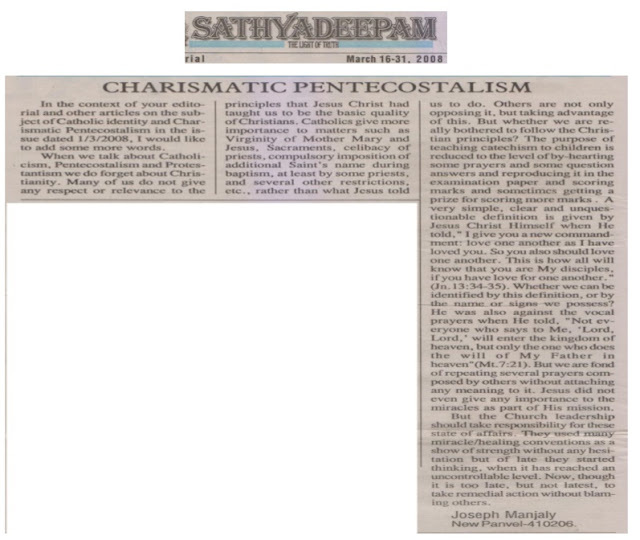 In the Sathyadeepam English edition THE LIGHT OF TRUTH (March 16-31,2008), I had written under the heading,"CHARISMATIC PENTECOSTALISM" distinguishing what is Catholicism, Protestantism, Pentecostalism and Christianity. What Jesus told and what we are doing? This is what Pope Francis told recently according to The Huffington Post reported under the heading “Pope Francis Slams Hypocrite Christians, Suggests Atheists Are Better”. It continued quoting Pope Francis, after he gave an example of a Christian boss taking a vacation as his workers went unpaid -- and issued a stern warning about where that will lead.